The Buchi V-100 is an economical and highly chemical-resistant diaphragm pump with a space saving design. It covers essential needs in vacuum generation. 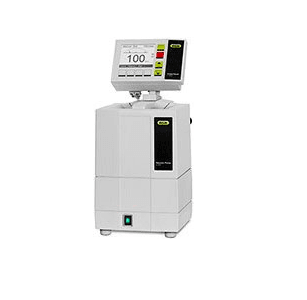 On/off regulated by the Buchi interface I-100, it is optimally suited to work with Rotavapor R-100. The ready to use pump will be delivered with a silencer and 6.5 feet of vacuum tubing. On 9/1/2015, BUCHI released the V-300 dual-head PTFE solvent-resistant diaphragm pump. 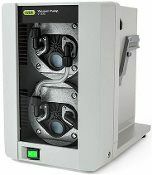 The V-300 is a chemically resistant PTFE diaphragm vacuum pump impresses with its very silent and economical operation. With a flow rate of 1.06 cfm and an ultimate vacuum of 3.75 torr (5 mbar), it is optimally suited to be combined with the Rotavapor® R-300. Ai is now the official dealer of Buchi products. These rotavapor systems are made in Switzerland with two-year warranty directly from Buchi Corporation.